Borussia Dortmund manager Peter Stöger has confirmed that he is leaving the club after guiding them to a return to the UEFA Champions League. The 52-year-old replaced Peter Bosz as head coach in December, and helped the team climb from eighth to fourth by the end of the season. Following a 3-1 defeat at Hoffenheim on Saturday’s final day, however, die Schwarzgelben just held off Bayer Leverkusen to clinch the last Champions League place. After the match, Stöger revealed that it would be his last Bundesliga fixture in charge of the five-time German champions. “Today was my final competitive game for Dortmund,” he said at a post-match press conference. 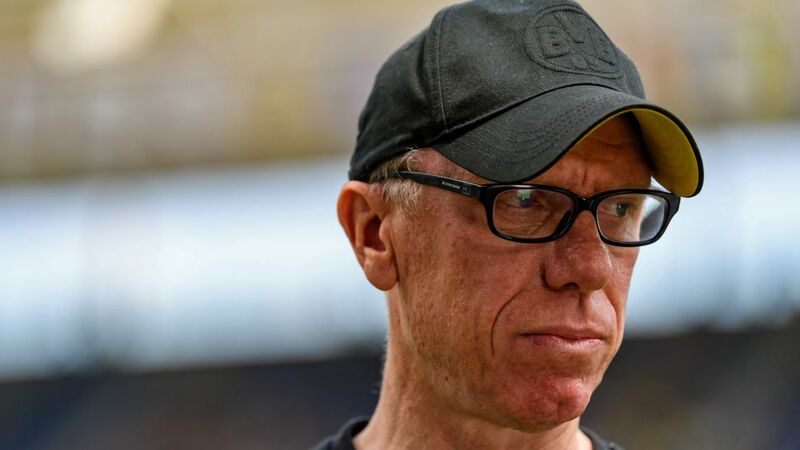 Stöger led Cologne to a fifth-placed finish last season before being sacked in the wake of the Billy Goats’ poor start to the 2017/18 campaign. Just a week later, though, the Austrian was asked to take over from Bosz until the end of the season, after Dortmund had gone two months without a league win. A victory over Mainz in Stöger’s first game in charge marked the start of a 12-game unbeaten streak in the Bundesliga. That run came to an end when Dortmund lost 6-0 at champions Bayern Munich on 31 March, however, and was soon followed by a 2-0 loss against Schalke in the Revierderby. In total, Dortmund lost four of their final seven league matches of the season. They also went out of both the DFB Cup and the UEFA Europa League at the last 16 stage, and – with a place in next season’s Champions League secured – both Stöger and the club’s executives have decided that it’s time for a change. “I’m happy that we achieved our most important goal,” Stöger said. Nice coach Lucien Favre – a former Hertha Berlin and Borussia Mönchengladbach manager – is a possible candidate to take over from Stöger when the latter’s contract expires at the end of June.